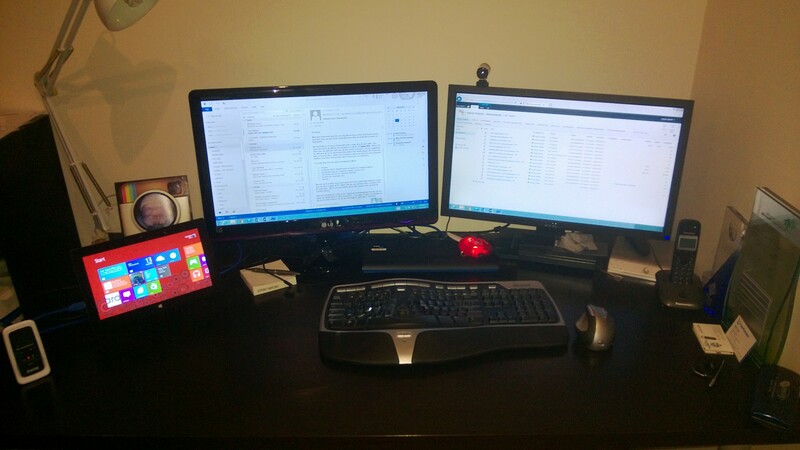 As mentioned in my previous blog post I have been using my Surface Pro as my exclusive desktop device & tablet for several weeks now. In this post I’ll be explaining how the Surface Pro is being used as a desktop – to give you the understanding that I am not treating this device any differently from my previous notebook. The device that connects all the hardware together is the Targus ACP71 docking station which cost around $220 + shipping. The unit is amazing as it handles two external monitors, 4 USB 2.0 device ports and 2 USB 3.0 device ports. I plugged a USB hub into one of the USB 2.0 ports to save space. Unfortunately the USB 3.0 A-B cable supplied by Targus was too short for my particular desk setup so I had to spend another $10 to get a longer cable. When going out for meetings locally I only take the Surface Pro, the Touch keyboard and stylus. I am currently looking for a small case to carry all this around, however one benefit I’ve found so far is that I don’t have to remove the Surface Pro from my bag when going through airport security. From time to time I do hear the relatively quiet whirring of the tiny fan inside of the Surface Pro, but that is when I have a lot of applications open and running at the same time, but a recent disadvantage has been a heat wave in Melbourne which has resulted in less-than-ideal air temperatures inside my house. Can I run virtual machines off it? Probably – but I’ve repurposed my old notebook to act as a portable virtual machine host for when I need to put on my IT Pro hat and do deep technical demonstrations with local resources. Otherwise I just access my lab environment remotely. Three weeks in with the Surface Pro acting as my sole device (other than my phone) – no regrets. Does the Surface Pro handle being used as a personal tablet, work tablet, and desktop machine? Perfectly.